Born in Buenos Aires, Argentina, I took knowledge of the Celtic world at the age of twenty motivated by my love of literary and musical subjects. Thanks to the collaboration of Janet & Robin Williamson ( http://www..pigswhiskermusic.co.uk) , and Sylvia Woods ( http://www.harpcenter.com) Irish harp champion, I began to incorporate, the melodies and knowledge of traditional techniques and instruments, focusing on the implementation of whistle and Gaelic harp. Ireland, with its legends and mythological cycle, lured me to cross the main gate of the Celtic world. Passion that lead me by 1985 to organize a Celtic Festival in Buenos Aires (historically the first took place in l960), as well as other cultural and musical activities within the Irish community living in Argentina, thereby developing an attitude because of the disregard on certain community sectors for their Celtic roots. Convinced of the need to create a center that would bring young people linked by inheritance and / or affection for their Celtic roots, in 1986 I participated as co-founder of the Celtic Association of Galician Pipers, crystallizing my longing for a Celtic awakening in South America . Identified with a deep pan-celtic commitment, studied the folklore and history of Ireland and its sister nations, Scotland, Wales, Brittany in Armorica, and Spanish celtic, Galicia and Asturias. Along with the Celtic group ‘Poitín’ belonging to this Association, I played the harp and whistles,and wrote some Gaelic poetry featuring a traditional projection of my own. In the year 1988 it was published in Spain my work’ Correspondence between the Galician and Asturian Legends’, a comparative test that parallels the grounds of Celtic folklore. This edition was done in Asturian language due to the management of the Celtic League de Asturias and the support of the Ministry of Education, Culture and Sport of Asturias. At the beginning of’90 and after several performances and a tour in Patagonia, for welsh communities settled in our country, ‘Poitín’ dissolves, leaving a testimony tape released independently in 1988, memorable for being the first of its kind in Argentina. Along with Manuel Castro I published in 1993 a book of poems called ‘Celtic Legacy’, a bilingual edition in Galician / Spanish, unprecedented, poems of own authorship and bardic styled. I took part as a co-founder of subsequent bands like ‘Lenda Gwyn’ and ‘Duir’, staying active with the latter about four years, and with whom O participated in the First and Second ‘Keltoi’ Celtic Festival ion Buenos Aires. In October l997, I performed soloist in the welsh ‘Gorsedd’ of Patagonia, Argentina, the first since 1910, where I was invited to join the Bardic Circle at the behest of the Welsh Community of Trelew. Later that month, I quit ‘Duir’ to pursue a solo project due to a proposal made by a record label in California, USA. This motivated me to meet other musicians of equal entity under a new name ‘Bran’, with whom I issued ‘Awen’, my debut CD album in July l998. Performances led me to the Astros Theater, Opera, Margarita Xirgu, Pelayo, Auditorio de Belgrano and ND Ateneo; Irish Centers, Theaters, Pubs and located in Rosario, Pergamino, Junin and La Plata, to reach the status of beings the first Argentine to participate in the “Celtic The 5th Celtic Meeting” held in Santiago de Chile in November 2002 and in the “Primer Festival Celta” in Montevideo in March 2003. Solo performances w/ Gaelic harp led me to various audiences and emblematic places as the Argentine Theatre of La Plata & Tortoni Café in Buenos Aires. In the month of May 2003, the prestigious folk Folc Galician folk group “Luar na Lubre” add music to one of my poems. This collaboration is crystallized in April 2004 with the inclusion of this piece on two tracks from the album “A Paradise Hai” published under the label Warner Music Spain. Alongside Bran, I did participated as guest musician of their South American tour, performing at the Opera Theatre in Buenos Aires on 12-7-04. Along with a friend musician , Gabriel Bollani, I developedin 2006/2007 a new Celtic musical project that combines virtual and acoustic sounds. Songs of love and hope, along with instrumentals experience a new hue under a new style which I decided to label as “New Celtic”. 1984-Co-founder with Miguel Cosentino Cormack of the “Sinn Fein” musical duet. 1988 – The work “Correspondence between the Asturian and Galician legends” is published in Asturias, Spain, with the assistance of the Ministry of Education, Culture and Sports of the Principate, and the Asturian Celtic League. 1988-Took part of the album “Poitín” being the first analog recording in Argentina with Celtic harp and composed original melodies on traditional styles. 1997- Co-founded the group “Bran”, a musical project through which I recaptured the spirit of Celtic traditional tunes with original arrangements inspired by the feelings and appreciation of its members. 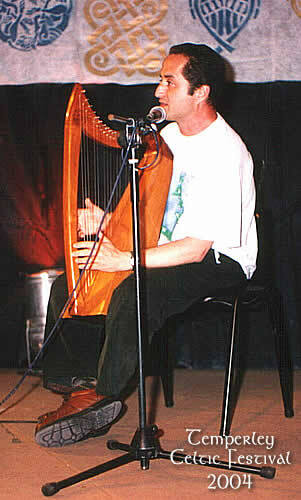 2002 – Participated with Bran at “The 5th Celtic Meeting” in Santiago de Chile, Republic of Chile. 2006/2007- Along with Gabriel Bollani, developmed and edited the “Celtic New Project” Songs of love and hope, instrumentals, treated with virtual acoustic sounds.